Gilas Pilipinas would soon face Qatar for their quarterfinal round in 2014 Asian Games on Friday in Incheon, South Korea. Last Tuesday, Gilas put the hard court ablaze winning against India with the score of 85-76. They had given India a hard fight and lead the game from start to finish, giving a good game to their fans. On Wednesday, however, Gilas had bowed against Iran with the score 68-63. Iran had given they quiet a pounding on their defense starting on the first minute of the game until the last. Gilas did not give up and kept of giving Iran a hard time. 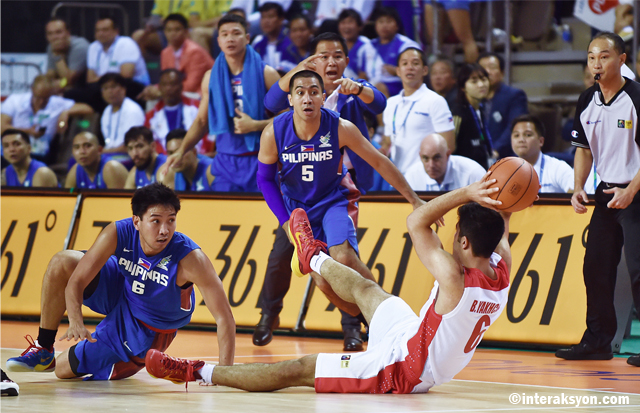 Iran players had been visibly exhausted as they chase around the swift and nimble Filipinos. Since Gilas had sadly lost the unbearing game, they would be in Group H of the competition together with South Korea, Kazakhstan, and their next opponent, Qatar. Qatar won in their first two games scoring 79-69 against Kuwait and 72-71 defeating Japan. The next match would be at 5pm Philippine time. Gilas will then face South Korea on Saturday at 1pm and face Kazakhstan around 2:15pm on Sunday. Iran is also scheduled to fight the national teams of China, Japan, and Mongolia. The two teams of each group would advance to semifinals. Watch Live Streaming Gilas Pilipinas vs Qatar 5:30 p.m. live on TV5 below..
Gilas faced defeat from Qatar with score 74-68. Gilas Pilipinas is now in their quarterfinals round and their first opponent, Qatar, who had ranked 47 in FIBA. Gilas had beaten Qatar in 2013 FIBA Asian Championship with the score 80-70. Gilas had put the hard court ablaze in their first game in Incheon 17th Asian Games and grabbed the win from India. Unfortunately, they were unable to repeat the win and bowed against Iran. Gilas is now in Team H with Kuwait, Japan and Kazakhstan. Game started with Tenorio, Chan, Douthit, Norwood, and Pingris, compriesed Gilas’s first five. Gilas had the ball first and Tenorio was immediately called back to bench and subbed by Alapag. Pingis missed the first free throw shots of the game. Qatar’ Watson scored two while Pingris finally basketed a free throw gaining the first score for Gilas. Gilas was failing to field goal until Alapag was able to basket a triple making the score 7-4 in favor of Qatar. Qatar had another triple but Douthit was able to gain two points. Free throws were awarded to Douthit and then he was able to do a jumper gaining the lead 10-9. Pingris shot 2 free throws before subbed by De Ocampo. Less than three minutes on the go, Tenorio got back to the game and immediately got two triples in the basket gaining again the advantage to 14-12. Qatar’s El Haddary had first free throw for Qatar and missed the first but shot the second. Gary Davis was fouled and Qatar was given penalty. He shot both but Qatar quickly regained more lead. Tenorio tied the game at 19 all with a triple. Second quarter started with Paul lee successfully shooting 2 triples gaining the lead tp 27-19. De Ocampo got back the two points gained by Qatar followed by another three by Dillinger as assisted by Douthit. Gilas called for a tome out with scores 32-24. Qatar shot a triple while Paul Lee faked and shot a jumper. Qatar’s Watson got free throws missed the first but took the second. Jeff Chan got back to the floor hiiting a trople while subbing for Lee. Gilas noticeable giving soft fouls to stopQatar’s attacks. Mohammed called for offensive foul. Chan was able to shoot despite two guards against him. Tenonio came in for Alapag. Qatar’s Mohammed scored while Chan missed his three point shot. Coach Chot Reyes shuffles his players, kept on subbing to give some breather for the players. Gilas lead the half game at 39-36. Second half opened with Qatar’s Watson shot two triples gaining back advantage at 42-39. Qatar turned up their defense and offensive and got another triple by Mohammed. Gilas’ offense was shutting down in the first minutes of third quarter. Another three was shot by Qatar making the score 51-39. David hits the basket giving the first score for Gilas in this quarter. Paul Lee got back to the game. Five minutes left but still no field goal for gilas while Qatar had 5 triples. Lee drove in with a two. Gilas’ team captain Alapag finally had a triple after a lot of tries to basket shots and kept coming for more making Qatar’s lead shorter into 56-51. Court on fire as Gilas’ Alapag carrying the team with his attacks on the basket. Qatar shot a basket with score 58-51. Pingris was called for traveling and De Ocampo went back to the bench and Douthit went out. Another three by Qatar. Mohmmed fought for the ball against Pingris feeling the heat of the game. Mohammed called out for unsportsmanlike behavior. Pingris shot two free throws making the scores 63-59 lead by Qatar. Gilas went into defense trying to block all attacks. Douthit was looking tired and Qatar is still making their lead higher. Chan had twp points making scores 69-61. Gilas feeling the pressure with 4 minutes left in the game as the ring kept on denying their shots. Qatar kept on going through the holes of Gilas’ defense gaining the score 74-65 with Mohammed leading the offense. Alapag finally shot three in the fourth quarter. Lee was fouled out of the contests making Coach Chot shout out his frustrations. Pingris got back in the game but Mohammed attacked him from behind making him miss his shot. The defense had been sloppy. David got onto the game before Gilas called time out, Qatar up with score 74-68. Qatar got another score with a free throw. Game ended 77-68 with Qatar still no lose.